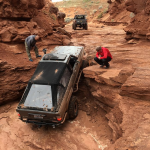 i know there is a few newer offroad parks around. to be honest i havent ventured out to much other than logging roads and forest service roads. love it up here though! So I've been having issues with my current beadlock setup, Little things like no balancing out and loosing the inner bead every now and then so I decided to upgrade. .....and Bead Locks not required!! I get very serious in the snow at 5 psi, Without beadlocks. My third year on the irocks, yet to throw a bead. My comment should be in the thread I started about too little or too much, but for me, 20+ years of 4-wheeling, I NEVER once popped a bead off a rim, and I NEVER once had a flat tire on the trail, I never had bead locks. Air down PSI was typically 10 lbs for rocks, and 4 lbs. for sand, snow, mud. I had both my 86 longbed and my 85 standard cab in the sand dunes a half dozen times - duning hard with the rest of the crazies and NOT ONCE did I pop a bead. Many snow-run and mud-run trips, Mud tires were always mounted on 15" alloy wheels. Was I just really lucky? Hey fair enough! I probably should have phrased that a bit differently, you are right they really aren't required for most guys. Half of our group doesn't run any sort of bead retention, but they usually stay around 5psi and don't have a issue. It depends so much on the particular tire and rim. I have had bias swampers that would roll off in the mid teens and my goodyears would stay on my 8" steelies at 2 psi. And the the bead lock on wheels. Some are more pronounced than others. When I worked at the tire shop, some wheels took alot of PSI to seat a bead. Others not so much. You could tell by the "POP" on which wheel had a higher bead lock. I remember when Hummers were all the rage, and we used to get calls out to Sandlake all the time. Cause their Hummer rolled a bead, and the central air couldn't air up the tire. 16.5" wheels don't hold a bead very well. 3rz swap, axle truss, hydro assist? Looks good. Nice to see you didn’t truss the axle. You don’t need it, more times than not I have seen a good straight housing get warped after trussing it. You’re knuckle gussets are all that is needed. Now with the 3rz swap. I've been struggling with getting the motor mated to the trans, seems like 3rd time was the charm. My first attempt the trans was in place and I tried to bring the motor into it, But as you can see in the first picture I struggled getting the motor on the angle it wants. Next attempt was dropping the trans and bolting the motor to the mounts, I had a buddy there to help me get the trans up but between the firewall clearance and the angle of the whole deal we just could not get them mated. Keeping the ps reservoir warm? Which mounts did you use? hows engine swaps in canada? regulated? Glad to see your still keeping that steering reservoir warm. Night and day difference between 22re and 3rz huh?